Totally Upgraded Seven Oaks Home! This Nohl Crest Home is located in Gated village of Pinecrest on almost half-acre(.49 offering large backyard and privacy from neighbors) cul-de-sac/Conservation/Lake Lot! Open Floor plan features 4 Bedrooms., 4 Full Bath, Sunroom, Office/Den plus upstairs Bonus Rm./5th Bedroom. w/oversized walk-in closet & Full Bath and 3 Car Garage. Split floor plan offers ample privacy. New 2018 Interior Paint! Check out the oversized lanai with Stone Pavered Deck. Salt Water Pool/Spa w/Child Proof Fence/New 2018 Gas Heater/Pool Pump/Motor & 2017 Pool Resurfaced. Entering the double glass front doors you are greeted by upgraded Wood Flooring, Crown Molding and gorgeous view of lanai and lake. Large Chefs Kitchen w/Island and Walk-In Pantry features New 2018 Jenn-Air Cook Top, Stainless Farmhouse Sink, Granite Countertops, Bosch Dishwasher, Tile Backsplash, Cabinet Hardware/Handles. All Baths have New 2018 Cambria Countertops, Under Mount Sinks and Faucets. New 2017 AC. Tankless Hot Water Heater. New 2018 Carpet in Master Bedroom. and New Toilet in Master Bath. Laundry Room has upper cabinets for storage and counter top for easy folding. Flagstone path to outdoor lighted sitting area at fire pit. 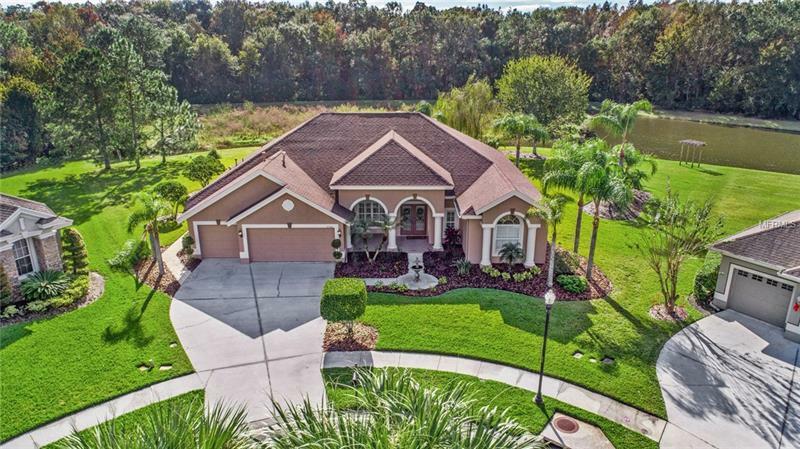 Seven Oaks is a wonderful community with Resort style pool, fitness center, tennis courts, walking trails, convenient to Florida Hospital, I-75/275, Wiregrass Mall, Restaurants, Center Ice and all that âNew Tampaâ offers.